Groundwater and soil contamination are among the most time-consuming and costly environmental remediation challenges facing our communities today. Solvents, metals, organic compounds, and other chemicals remain in the soil and seep into groundwater long after the facilities that used or created the contaminants have stopped operating. Sites with significant groundwater contamination problems include industrial processing facilities, military installations, and former nuclear weapons production sites. Scientists at the U.S. Department of Energy's Pacific Northwest National Laboratory (PNNL) in Richland, Wash., are performing research and developing technologies to treat contaminated soil and groundwater. These technologies are being moved out of the laboratory and into commercial practice where they can solve critical problems for industry and society. In situ redox manipulation (ISRM) has emerged as one of the most effective methods for treating groundwater contamination, particularly chromium and technetium, with the potential for treating chlorinated solvents such as trichloroethylene as well. ISRM has been used to treat contaminated groundwater at the Hanford Site in eastern Washington and at the Frontier Hard Chrome Superfund Site in Vancouver, Wash. Future ISRM installations at other sites, which are being cleaned up under the Federal Superfund program, are also possible. ISRM works by injecting a solution of sodium dithionite into standard groundwater wells. The solution reacts with iron in the soil to form a permeable reactive barrier. As groundwater flows through the barrier, the treatment solution reacts with the targeted contaminants to destroy or immobilize them. The size of the barrier is determined on a site-by-site basis. For example, at the Frontier site in Vancouver, analysis of the contamination source area dictated a 250-foot long barrier. At Hanford, scene of the nation's largest nuclear cleanup effort, the contaminant plume required creation of a 2,000-foot long barrier. ISRM is more effective and less expensive than many standard remediation methods. ISRM can reach deeper than trench-and-fill permeable barriers, which often can't be dug deep enough to reach contaminated groundwater in many locations. And it is typically much more cost-effective than pump-and-treat systems since it eliminates the need for endless pumping. It has been estimated that ISRM may cost as much as 60 percent less over a 10-year period than other remediation methods, particularly, pump-and-treat. The barrier is long-lived, remaining effective for up to 20 years, and if needed, it can be rejuvenated using the well network already in place. ISRM uses existing groundwater wells -- unlike traditional pump-and-treat methods, which typically require building new or permanent structures to deploy the technology. Another advantage of ISRM is that it is done below the surface, significantly reducing the potential for worker exposure to contaminants. ISRM has great potential for treating other groundwater problems. PNNL is currently performing research to adapt the technology to other contaminants, including solvents and explosive compounds. Initial field testing at a site on the Ft. Lewis, Washington Army base showed encouraging results for the in situ destruction of trichloroethylene. For a particular application, PNNL staff typically conduct the initial investigations including characterizing the geohydrologic conditions, specific contaminants, and size of the plume, and then design an ISRM barrier that will treat the contamination to meet appropriate requirements and the needs of the user. The technology is then licensed to the customer for construction and implementation of the barrier. In situ bioremediation (ISB) is the use of microorganisms to degrade contaminants in place and turn them into water and harmless gasses like carbon dioxide (CO2). Like ISRM, this technology was developed as a less costly, more effective alternative to the standard pump-and-treat methods used to clean up aquifers and soils contaminated with chlorinated solvents, fuel hydrocarbons, explosives, nitrates, and toxic metals. ISB destroys contaminants, lowers risk to site workers, and lowers certain equipment and operating costs. Accelerated ISB is the process of adding a solution to the contaminated area that stimulates the growth of specific bacteria to degrade a targeted contaminant. All bacteria have a specific reaction process. On a site-specific basis, the levels and types of contamination are analyzed in conjunction with other site information, and a targeted solution is developed that will stimulate the bacteria to degrade the contaminants. This process increases the rate at which contaminants are degraded compared to natural conditions. 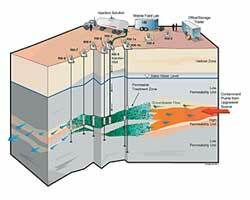 Monitored natural attenuation (MNA) can reduce contamination without adding anything to the subsurface. One component of natural attenuation is the action of microorganisms already present at the site that are degrading the contaminants of concern without adding supplemental solutions. Other physical attenuation mechanisms, such as dispersion and sorption, may also be important. The choice of ISB or MNA for use at a site depends upon aquifer properties, chemical concentrations, goals of the remediation project, and the economics of each option. The rate of contaminant degradation is typically slower for natural attenuation than for bioremediation because the concentration of bacteria is much greater in accelerated bioremediation and the biodegradation rate is proportional to the number of bacteria. Thus, natural attenuation typically takes longer to complete. Accelerated ISB usually provides a faster solution, but it has a greater investment in materials, equipment, and labor. The challenge in applying in situ bioremediation or monitored natural attenuation lies in understanding the nature and extent of the contamination, as well as in understanding the regulatory requirements that allow for its use. The PNNL laboratory has developed a bioremediation simulator for the design of accelerated ISB projects. The Reactive Transport in 3-Dimensions (RT3D) fate and transport modeling code also has been used to support selection of monitored natural attenuation bioremediation of sites on the U.S. Department of Defense and National Priority List sites. For example, at the Naval Air Base Ventura County, Point Mugu, Calif., a leaking underground storage tank contaminated about two acres of groundwater with trichloroethene and dichloroethene. PNNL designed a pilot-scale test using RT3D to evaluate the effectiveness of two microbial processes within the contaminated aquifer. The design was successfully field-tested and resulted in complete degradation of contaminants to non-hazardous compounds. PNNL has also replaced a pump-and-treat remedy with monitored natural attenuation at a National Priority List site using RT3D numerical modeling to show that the plume would not migrate to receptors with the pump-and-treat system off. PNNL also conducts research into determining the fundamental properties involving the transport and degradation of other contaminants in the subsurface environment. This research will help determine the ultimate toxicity of such contaminants and lead to remediation techniques. For example, recent evidence shows that a relatively new explosive known as CL-20 (hexanitrohexaazaisowurtzitane), is anywhere from one to five times more toxic in soil and groundwater than other explosives such as TNT, RDX (Cyclotrimethylenetrinitramine, also known as Royal Demolition eXplosive, cyclonite, or hexogen) and HMX (cyclotetramethylene-tetranitramine, also known as Octogen). CL-20 contamination in the soil and groundwater resulted from uncontrolled releases during the manufacture, storage, low-order detonation, or deployment of unexploded ordnance and munitions. Researchers at PNNL are investigating the treatment of CL-20 contamination by evaluating its potential for transport through the subsurface environment. Unlike RDX, which moves nearly unretarded in groundwater, sorption and degradation of CL-20 tends to mitigate the risk of the contamination migrating through soil. However, CL-20 can migrate deeply, complicating attempts at remediation. Experiments show that CL-20 reacts both biotically (with living organisms) as well as abiotically (with non-living environmental elements, such as light, water, and dissolved gases). These reactions significantly impact its fate. PNNL's research has shown that CL-20 can be rapidly degraded in a natural subsurface environment under alkaline conditions (where the pH is less than 10) via enhanced bioremediation (as described above). However, degradation of CL-20 to intermediate byproducts may not be adequate to fully mitigate the environmental impact since some byproducts (such as formate) may, in fact, be more toxic than the CL-20. Finally, PNNL's research also indicates that, although CL-20 is observed to rapidly migrate through sediments and is likely to be persistent for years in soil and groundwater, remediation techniques based upon abiotic and biotic degradation mechanisms (reduction of CL-20 directly to carbon dioxide) may prove to be highly effective. The technologies mentioned here are a sampling of the methods that have been researched and developed to treat contaminated soil and groundwater. PNNL researchers continue to seek out new and improved treatment mechanisms, both in terms of existing problems as well as issues that are emerging as future concerns.